has the weathered, snarly, romantic tone of its star performer. But will Lorenz hit his baseball flick out of the park? Aging Atlanta Braves baseball scout Gus Lobel (Eastwood) is losing his sight and probably his job. Pete (John Goodman), his boss and best friend, fights to save Gus’ job and gives him a make-it-or-break-it assignment—to look over the potential number one draft choice in the country, Bo Gentry [love the name!] and decide whether he’s a future major league star. Loyal but nervous, Pete hedges his guess that Gus still has what it takes by asking the scout’s daughter Mickey (Amy Adams) to accompany him on the road trip. A lawyer with a chance of making partnership in a prestigious firm, Mickey shouldn’t agree to help—but does, out of a hope that she can finally achieve an emotional connection with her dad. 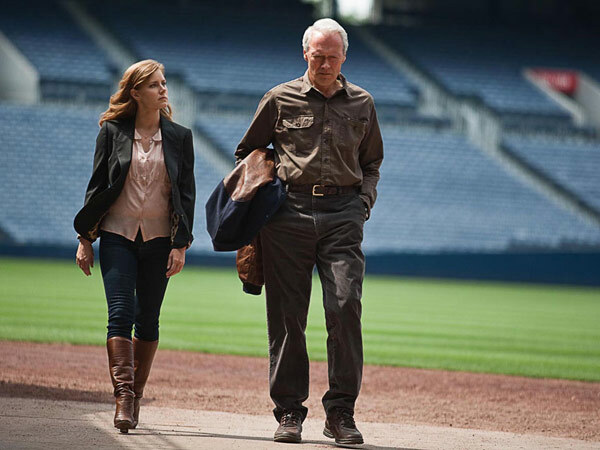 Further complicating matters is Red Sox scout Flanagan (Timberlake) who admires Gus and starts to fall for Mickey. As it happens, the Sox have first pick in the draft and the Braves have number two. Who will win in this game of unrequited love? Will Mickey and her dad finally connect? Will Mickey fall for Flanagan? Who will choose Gentry in the draft? And, of course, does the star athlete have trouble hitting a curve ball? This film is full of stars doing their thing: Eastwood growls, Adams is funny and lovely, Timberlake is sincere and passionate but with a hidden agenda, Lillard puts up a sincere front and Patrick is tough but edgy. And then there’s Goodman, an amazing actor, who somehow makes Pete into something resembling a three dimensional character. Lorenz moves the film along briskly and does know how to pace comic moments properly. But he can’t triumph over a cliché-ridden script that doesn’t allow Eastwood and Adams to truly connect as a father and daughter. It’s the heart of the film, or could have been, if Lorenz had known how to fight for it. Baseball fans will enjoy the scenes in the park and be intrigued by the opposition of old-fashioned scout Lobel and Moneyball embracing Phillip (Lillard). A few Adams and Timberlake fans will enjoy seeing the two embrace. And Eastwood fans may enjoy the old boy doing his patented snarl-with-a-heart-of-gold routine. The rest of us will wish that someone had believed in the story and tried to fashion a genuine tale of a father and daughter trying to connect with each other.